탈린, 에스토니아의 유포리아 | 호스텔월드에서 예약하세요. 2 minutes walk from ‘Freedom Square’ next to the old town, center of Tallinn. Euphoria Hostel is known immediately by the colourful graffiti on the front door by infamous Baltic artist SAKI. Quick access to public transport, supermarket and attractions make it a perfect location for your holiday headquarters. 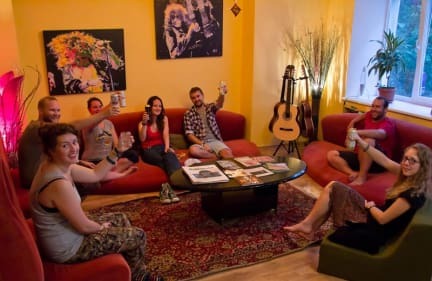 Euphoria entertains its guests with musical jams, workshops and concerts in their common lounge area all year round. Informed staff can help you with local tours, events and pub crawls helping you to live like a local and make the best of your stay. Had a wonderful stay! Nice steps and comfortable stay. I wanna give hundreds of stars! XD alreday miss Euphoria!! This is a nice hostel with many kitchens and fridges. Musicians or people who are interested in instruments are more than welcome. Kind staff. Would definitely recommend.